Christmas at the Schill house would not be complete without dozens and dozens of cookies. From good old-fashioned sugar cookies, to butterballs, to cranberry biscotti...we bake up quite the storm! 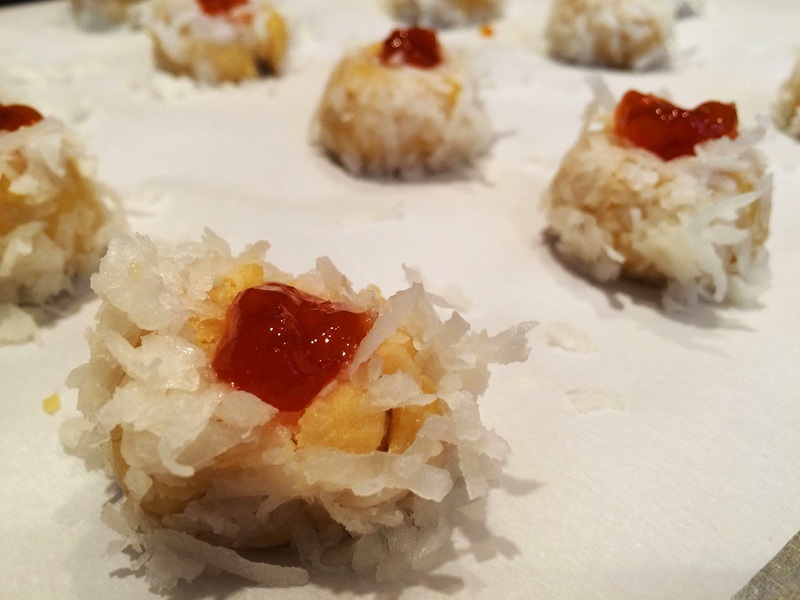 Though I love cookies in any form, my absolute favorite recipe around the holidays is for our coconut thumbprint cookies. When I say they're to die for, I'm not even kidding...the recipe has been in my family for over 100 years! My great-grandma passed the recipe down to my mom, and we've been baking them together every Christmas for as long as I can remember. 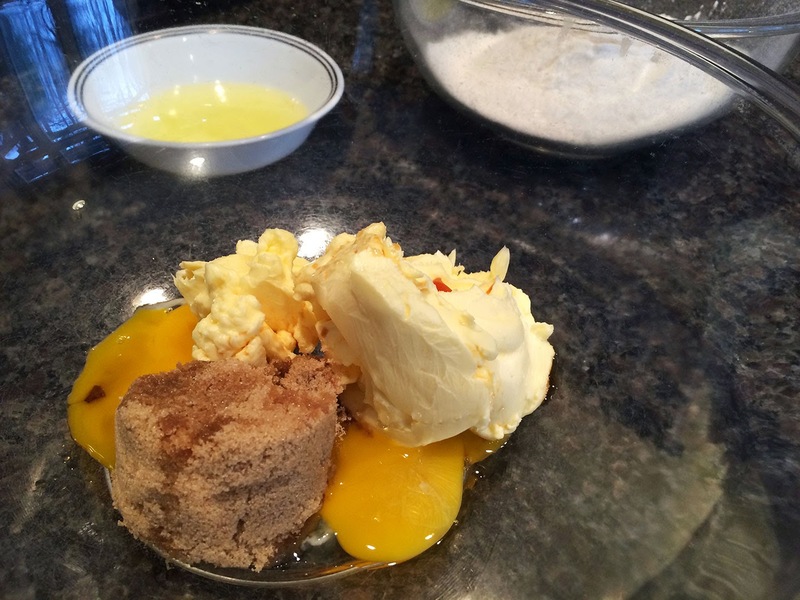 The hardest thing about the recipe is making enough to keep everyone satisfied! I swear once you bring them to somebody, they keep asking for them year after year! Start by preheating the oven to 350° F. In a large bowl, cream together the brown sugar, butter-flavored shortening, vanilla extract and egg yolks. Note: keep the egg whites in a separate bowl and set aside...we need these later to help the coconut stick to the cookie! Sift the flour into a small mixing bowl, add the salt, and stir until combined. Gradually stir the dry ingredients into the wet ingredients, and do NOT use an electric mixer for this step! If the dough appears to be slightly too dry and crumbly, add an extra egg yolk to the mixture and press together with your hands. This happens from time to time because egg yolks vary in size depending on the brand you buy. 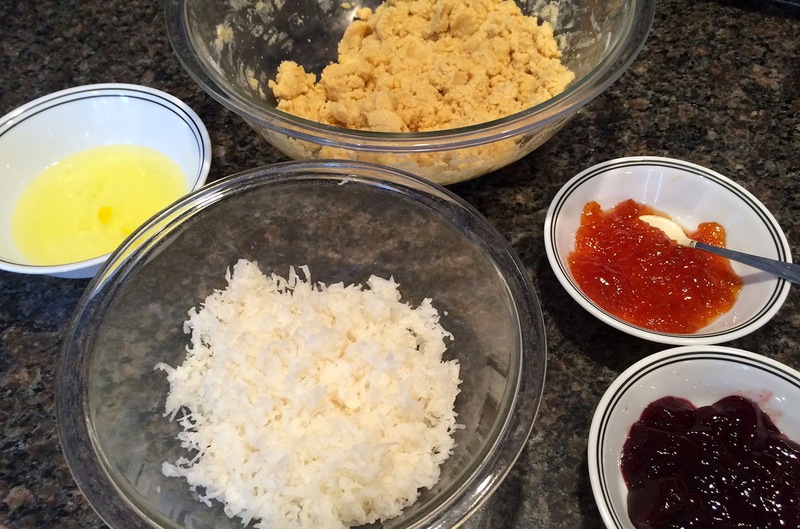 Once the mixture is thoroughly combined, we place the egg whites, coconut and jam in separate bowls. Once everything is set up for the cookies, roll the dough into 1" diameter balls. It's definitely easiest to roll all the balls out at once before you get your hand covered in eggs and coconut! Dip first in the egg, then in the coconut; the egg helps the coconut stick to the dough. 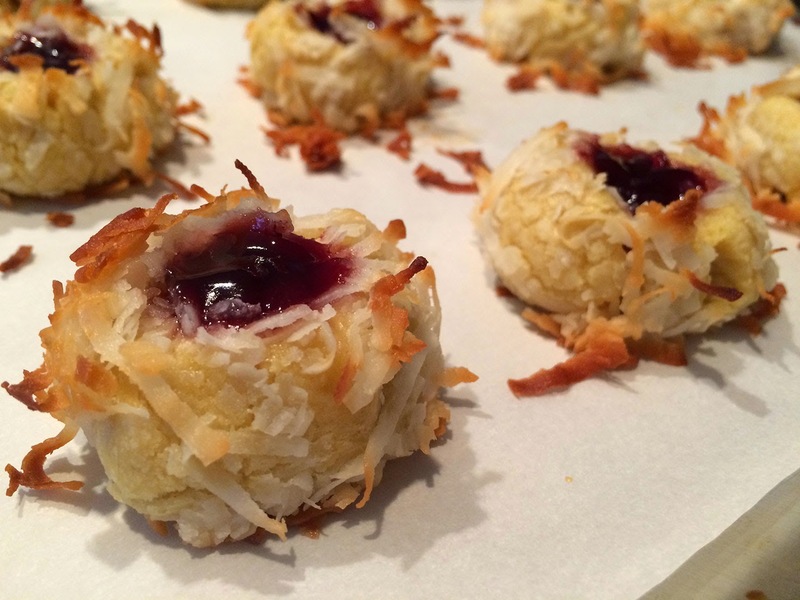 Mmmm coconut is my all-time favorite baking ingredient! 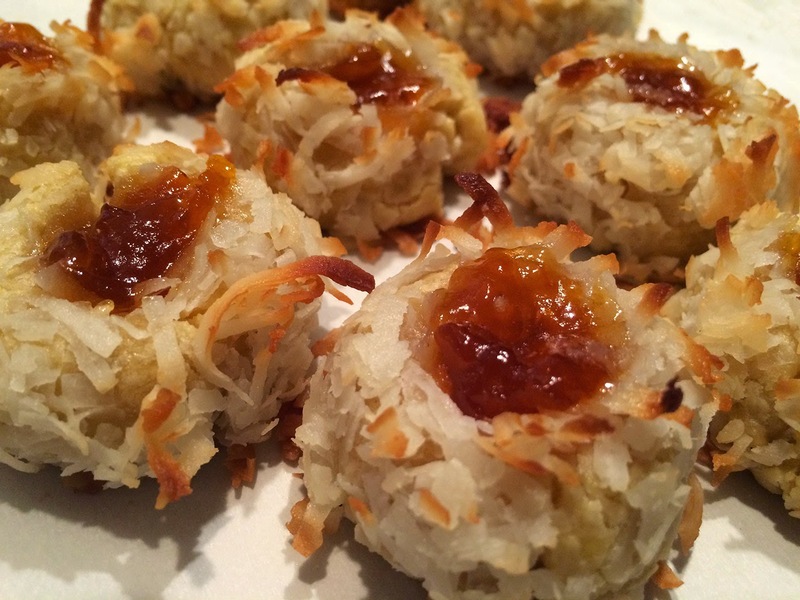 If you don't like coconut, feel free to roll the cookies in crushed walnuts instead! 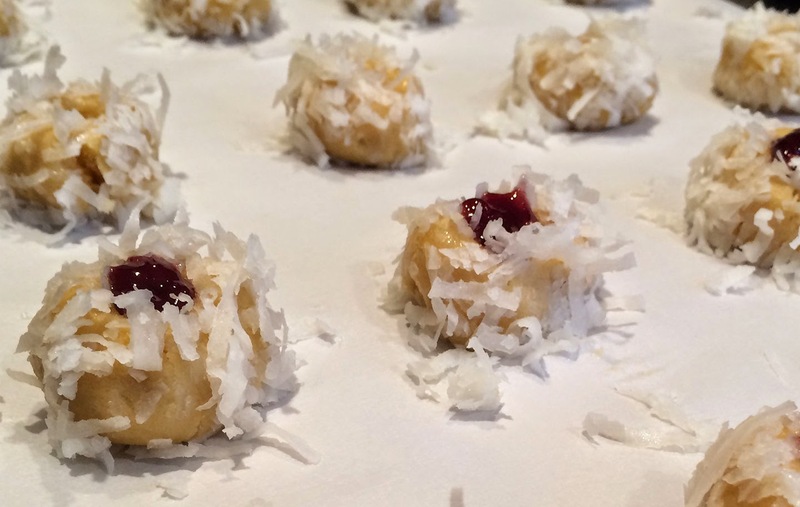 Place each coconut-covered dough balls on a baking sheet lined with parchment paper. Once you get all of the cookies onto the trays, use your thumb to make a small indent into the center of each cookie to hold the jam. We actually use baby spoons from when my brother and I were little to spoon the jam into each thumbprint! Our first batch had raspberry jam in the center, our second batch had apricot jam in the center, which sounds unusual but is SO good. 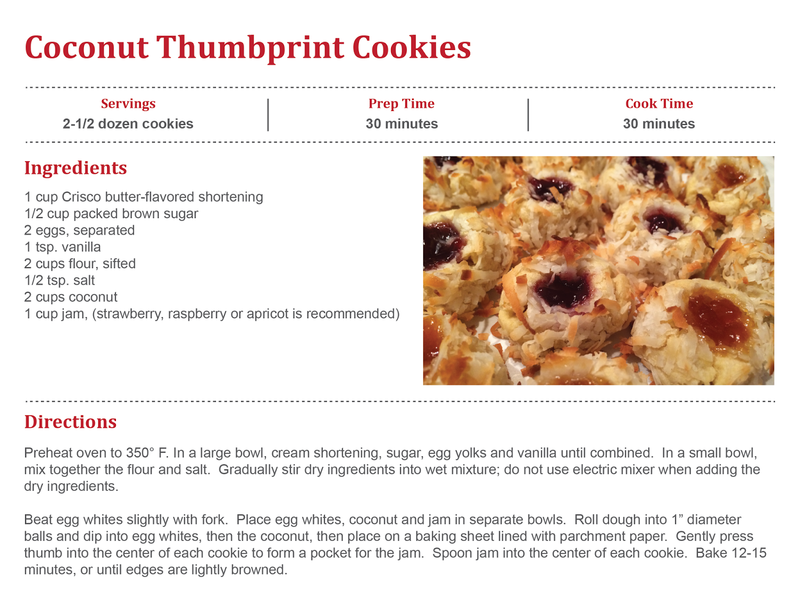 If we hadn't run out of strawberry jam earlier this week, I swear we would've had a batch of strawberry thumbprints too! You can never have too many! Once you have them laid out on the tray, all that's left to do is bake for about 14-15 minutes. Once the cookie turns golden brown and the coconut deepens in color and develops a toasted flavor, you know they're done! This is clearly a very photogenic dessert, but they seriously taste even better than they look! Try them this Christmas!